DUBLIN, April 11, 2018 /PRNewswire/ -- Perrigo Company plc (NYSE; TASE: PRGO) and its partner Dexcel Pharma Technologies, Ltd., today announced the launch of store brand Omeprazole Delayed Release Orally Disintegrating Tablets 20mg (Omeprazole ODT), an over-the-counter (OTC) medication to treat frequent heartburn. Omeprazole ODT is an FDA-approved medication, featuring MelTech™ melt-in-your-mouth technology, that dissolves in the mouth without water. This product is packaged and marketed as a store brand or retailer 'own label' brand and will provide consumers with a high-quality option for treating frequent heartburn. "Consumers want a heartburn medication that provides effective, long-term relief, but they also want a product that is easy and convenient to take," said Jeff Needham, Executive Vice President and President, Consumer Healthcare Americas. 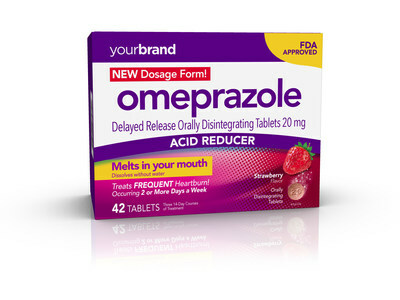 "Our novel Omeprazole ODT product combines the effective heartburn relief of omeprazole with innovative MelTech™ melt-in-your-mouth technology that heartburn sufferers desire. Perrigo is excited to be the first to bring this innovation to the heartburn OTC category while still delivering quality, affordable store-brand products to consumers. Perrigo will continue to invest in these types of opportunities, where national brand alternatives do not currently exist. Our marketing and regulatory teams are leading innovation to drive growth and meet the needs of consumers, patients and families." Please visit http://www.DissolveYourHeartBurn.com for more information. Perrigo Company plc, a leading global healthcare company, delivers value to its customers and consumers by providing Quality Affordable Healthcare Products®. Founded in 1887 as a packager of home remedies, Perrigo has built a unique business model that is best described as the convergence of a fast-moving consumer goods company, a high-quality pharmaceutical manufacturing organization and a world-class supply chain network. Perrigo is one of the world's largest manufacturers of over-the-counter ("OTC") healthcare products and suppliers of infant formulas for the store brand market. The Company also is a leading provider of branded OTC products throughout Europe, as well as a leading producer of "extended topical" prescription drugs. Perrigo, headquartered in Ireland, sells its products primarily in North America and Europe, as well as in other markets, including Australia, Israel and China. Visit Perrigo online at (http://www.perrigo.com). *Prilosec OTC® is a registered trademark of Procter & Gamble. Store Brand Omeprazole Delayed Release Tablets and Orally Disintegrating Tablets are not made by or affiliated with Procter & Gamble. Dexcel Pharma is a privately-held, international specialty pharmaceutical company based in Israel. Founded in 1968, Dexcel Pharma develops, manufactures and markets value adding branded and generic pharmaceutical products based on its proprietary drug delivery systems, including the MELTech™ Technology, that enables orally-disintegrating tablet formulations with delayed-release and extended-release profiles. Certain statements in this press release are "forward-looking statements." These statements relate to future events or the Company's future financial performance and involve known and unknown risks, uncertainties and other factors that may cause the actual results, levels of activity, performance or achievements of the Company or its industry to be materially different from those expressed or implied by any forward-looking statements. In some cases, forward-looking statements can be identified by terminology such as "may," "will," "could," "would," "should," "expect," "forecast," "plan," "anticipate," "intend," "believe," "estimate," "predict," "potential" or the negative of those terms or other comparable terminology. The Company has based these forward-looking statements on its current expectations, assumptions, estimates and projections. While the Company believes these expectations, assumptions, estimates and projections are reasonable, such forward-looking statements are only predictions and involve known and unknown risks and uncertainties, many of which are beyond the Company's control, including: the timing, amount and cost of any share repurchases; future impairment charges; the success of management transition; customer acceptance of new products; competition from other industry participants, some of whom have greater marketing resources or larger market shares in certain product categories than the Company does; pricing pressures from customers and consumers; potential third-party claims and litigation, including litigation relating to the Company's restatement of previously-filed financial information; potential impacts of ongoing or future government investigations and regulatory initiatives; resolution of uncertain tax positions; the impact of U.S. tax reform legislation and healthcare policy; general economic conditions; fluctuations in currency exchange rates and interest rates; the consummation of announced acquisitions or dispositions and the success of such transactions, and the Company's ability to realize the desired benefits thereof; and the Company's ability to execute and achieve the desired benefits of announced cost-reduction efforts and other initiatives. In addition, the Company may be unable to remediate one or more previously identified material weaknesses in its internal control over financial reporting. Furthermore, the Company may incur additional tax liabilities in respect of 2016 or be found to have breached certain provisions of Irish company law in connection with the Company's restatement of previously filed financial statements, which may result in additional expenses and penalties. These and other important factors, including those discussed under "Risk Factors" in the Company's Form 10-K for the year ended December 31, 2017, as well as the Company's subsequent filings with the United States Securities and Exchange Commission, may cause actual results, performance or achievements to differ materially from those expressed or implied by these forward-looking statements. The forward-looking statements in this press release are made only as of the date hereof, and unless otherwise required by applicable securities laws, the Company disclaims any intention or obligation to update or revise any forward-looking statements, whether as a result of new information, future events or otherwise.